This sea-facing hotel on the shores of Bali’s Seminyak Beach and adjacent to some of island’s chicest shops and nightlife checks all the right boxes for a tropical getaway. It sits on the most beautiful beach of Bali where the sand is a gorgeous shade of gold and the the tropical breeze that rolls off of the water brings the kind of serenity you’d love to bottle up and take home. 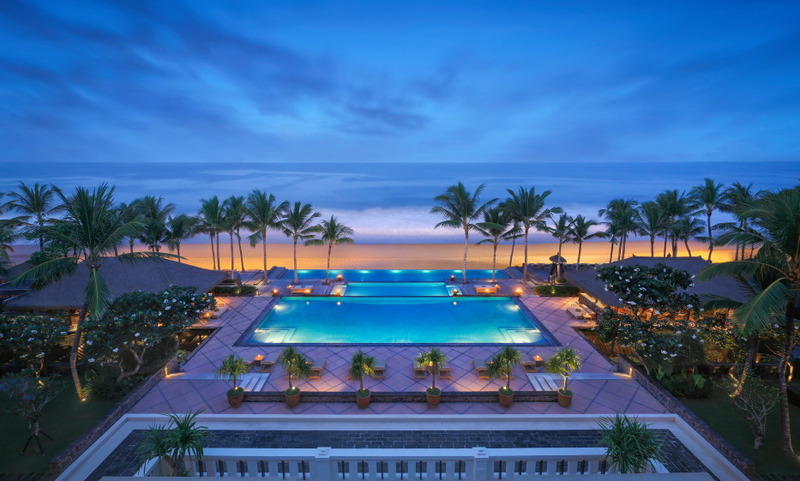 The Legian Bali is just what the doctor ordered for weary souls seeking an escape from daily grind. The hotel perfectly captures the otherworldly charm of the mysterious and magical island of Bali, from the minimalism of the suites with Zen interiors to the setting of its tiered infinity pool that seems to flow into the ocean beyond. Reality becomes a magical experience as the sun sets over the water and the sky begins to morph from baby blue to shades of pink, purple and scarlet red in a kaleidoscopic sunset. The best place to kick back and enjoy this show is the Ocean Champagne Bar, but lazing on the beach is perfectly acceptable too, and perhaps the definition of travel goals. Superb beachfront location with fantastic sunset views. The best hotel we could have booked, great and friendly staff, great location - just perfect for an unforgettable holiday! Thanks to the staff, who made a dream come true! We will come back soon! A great hotel, conveniently located in Seminyak. Looking forward to our next stay. I loved my stay and felt the staff in the restaurant were fabulous, particularly Tony. Was lovely to have chef visit us at our table at dinner to see if we were happy. Overall a lovely stay and nice that soft drinks and juices were complimentary. Complimentary water and treats at the pool were very appreciated. Absolutely love The Legian. Was expecting it to be wonderful but it exceeded our expectations. We didn't want to leave and can't wait to return. Fabulous hotel with courteous staff and service, will definitely be returning. Thank You. Absolutely wonderful exceeded our already high expectations. A beautiful hotel in a perfect position on the beach, close to the many shops and restaurants in Legian if you want to venture out. The staff are the most professional, knowledgeable and courteous we have every come across. They all made you feel special with little details like knowing your names, remembering what you liked to drink at breakfast, your preferred lounger near the pool without being too invasive. They really made our stay extra special lovely people. we had a very nice experience at The Legian Hotel. A great hotel with excellent staff.